The Certified Technology Procurement Specialist (CTPS) is intended for individuals who specialize in technology procurement with a focus on vendor/contract management. This program allows individuals in intermediate-level procurement positions to achieve professional certification and provides a path to a higher level of achievement and professional recognition. 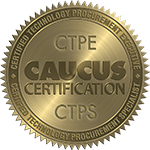 The CTPS program can be a first step in achieving advanced accreditation—Certified Technology Procurement Executive (CTPE). The CTPS/CTPE program establishes a pathway that acknowledges competence and achievement in the field of technology procurement. The CTPS program exam consists of 2 modules and 2 examinations. You will receive an email after you complete each test specifying your outcome. A score of 70% or better for each module is required to receive your certification, and the results of your exam will be provided to you immediately upon completion. (Exams may contain some questions that are being validated for future exam use. Validation questions will not be included in score computation.) Examination results will not be discussed over the telephone. Please note: The CTPS Exam is designed to be an in depth test assessing the learning and skill of the individual acquired through his or her study, knowledge, formal education, and lengthy IT procurement work experience in the areas of procurement, legal, finance, information technology and contract management. Using our CAUCUS review modules may be helpful as a partial refresh. However, these review modules do not contain answers to all of the questions that may appear in the CTPS Exam.